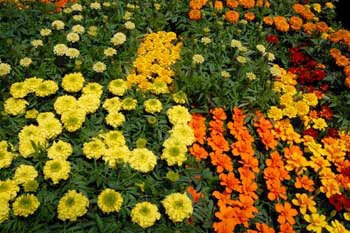 Marigolds are diverse plants that are often used in landscaping as well as in hanging baskets and container plantings. They come in a variety of colors including cream, yellow, gold, orange and red. They are somewhat drought tolerant and heat tolerant after established, they need water when the soil surface is dry. While they are hardy, they need fertile, well-drained soil and should be fertilized at least once a week to maintain blooming. Regular deadheading also helps keep them blossoming. Signets are tiny single bloom flowers that are edible and used as decorations in salads.